Come join us for an evening of CONSTRUCTION!! Had enough of the construction around Duerksen Fine Arts Center? Rhatigan Student Center? Thinking of buying your own hard hat to complete your stylish evening wear? Look no further! 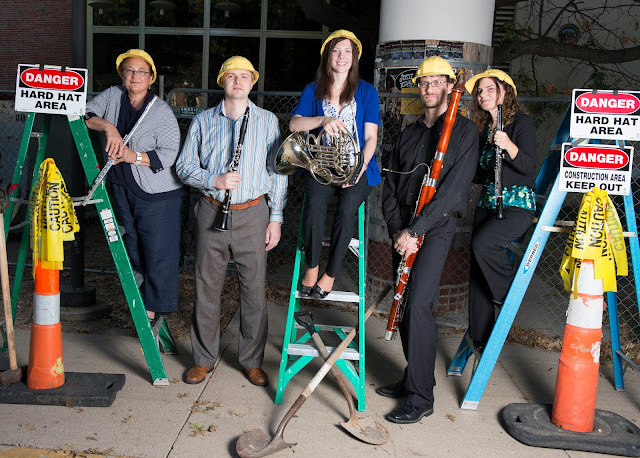 The Lieurance Woodwind Quintet is reconstructing your idea of a recital, from the ground up. Starting with a work for solo clarinet, Solo de concours by French composer André Messager, we then move to the brilliant Brazilian duet for flute and bassoon, Bachianas Braileiras No. 6 by Heitor Villa-Lobos. Adding more members, we perform the virtuosic trio of Beethoven,Variations on ‘La Ci Darem La Mano’ for oboe, clarinet and bassoon. A lush quartet for piano and winds by Camille Saint-Saëns, Caprice on Russian and Danish Airs, builds the scaffolding further.....finally, Samuel Barber’s seminal quintet Summer Music completes the building process. Now...come watch us blow the roof off!